With our move, we added a member to the family....our garden. A good size too, complete with built in irrigation. A lot of dreams were fulfilled with this move, like this garden, and sometimes I still can't believe it's real life. Pinch me! The previous owners had done all the planting too, and left a plethora of growing produce for us to harvest. So far we've seen lettuce, chives, broccoli, cherry tomatoes, beef steak tomatoes, squash, cucumbers, string beans, sugar snap peas, and zucchini. These zucchini are laaaaaaarge and in charge. I mean quite literally the biggest zucchini I've ever seen in my entire life. I didn't think it was possible for them to grow so big. So, we've grilled the zucchini for dinner. We've made Sawyer puree's out of the zucchini. We've tossed it in cold quinoa salads and warm veggie bowls, and then we ran out of ideas....and still had zucchini coming out of our ears. Then I remembered you can make it into bread...and I wanted to take it a step further and make them into muffins. I like muffins because 1) they're cute and small 2) control portion size and 3) they're easy to freeze. So on Labor Day with the rain pounding outside and Bon Iver's lyrics soothing my soul, I became a zucchini muffin makin' machine. I found a recipe and used it as a base, removing ingredients I don't like to bake with like refined sugar, white flour, and crop oils, and replaced those with very wholesome, nutrient dense alternatives like coconut palm sugar, oat flour, and avocado oil. 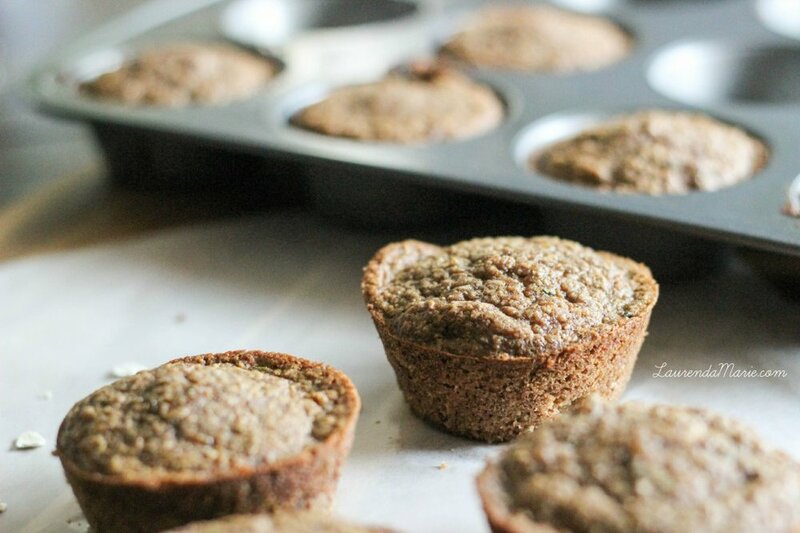 I also love these muffins because they have a hidden veggie that cannot be detected. I promise you that. Feed them to your kiddos and they'll have nooooo idea they're eaten' something green. They're sweet & aromatic, and a bit reminiscent of all my favorite fall flavors. Must be the added cinnamon and nutmeg. Mmmmm.